Home for the next two weeks was arranged by Paul Homer of Fordham Prep. Paul is the husband of Karen Homer, Librarian of North Side School on Long Island. 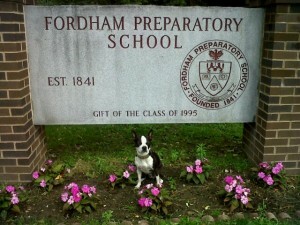 Fordham Prep is a high school which should be the model for all schools. Talented, engaging teachers are the norm for this preparatory school. I arrived on this campus which has begun summer break and found it nearly empty, which is not what I am used to. That changed when a very nice young man and his coach headed my way, he introduced himself as the senior class president. This polite young man was a pleasure to talk with as he marveled at the promise of One Million Acts Of Kindness. One of the values if this school is kindness, a great value for a school to instill in it’s student body. It’s motto is “Love and Conscious Virtue”. One could tell from our short conversation that the class president has already adopted the motto. I headed towards Central Park at 6am and found the best parking spot in Manhattan, on Central Park West at W72nd, it’s like NYC rolled out the “Red Carpet” for The Kindness Bus Tour. Tens of thousands of people will have direct contact with me over the next few days. The paparazzi are taking every imaginable photo of The Kindness Bus. Even Bogart feels a little left out. This is going to be a great couple of weeks. This entry was posted on Thursday, June 17th, 2010 at 1:09 pm	and is filed under Kindness. You can follow any responses to this entry through the RSS 2.0 feed. You can leave a response, or trackback from your own site.